From a very young age, Tatyana had a passion for fashion, design and particularly for timeless 1950’s era style. Bettie Page Clothing was born from her desire to create high quality, vintage-inspired pin-up dresses and clothing that hearken back to the golden age of American glamour and fashion. 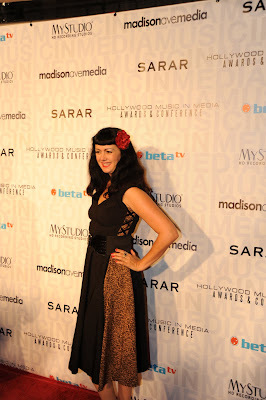 Bettie Page Clothing’s famous friends include Holly Madison, Pink, Claire Sinclair, Manouschka Guerrier, Jeanette Blomquist, Alison Pill, Miranda Lambert, Kellie Pickler, Bridget Marquardt, Sam Lonigro, Ayla Kell, Amanda Holden, Dita Von Teese, Betsey Johnson, Lisa Remillard, Mo Collins, Penelope Cruz, Niecy Nash, Leighton Meester, Denise Richards, and many more! Come visit one of their locations in San Francisco, Hollywood, Las Vegas, or San Diego. It doesn’t hurt to get a little “catty” when it comes to your wardrobe. The Side Effect Black & Leopard Dress ($130) is for the feisty girl that wants to stand out amongst the crowd! You’ll feel stylish and confident once you slip on this dress. Others will not be able to help but take notice. This dress is made of stretch bengaline, which makes it comfortable and very flattering on my curves. It features a peek a boo side made of leopard bengaline that is tied together with decorative black ribbon that releases a full circle skirt. The detachable red and black satin roses add a sweeter touch of sophistication and for a cheeky bit of fun. It looks great with my “brand new” Jessica Simpson Nichola Pumps that I bought for just $5 at a local thrift store. Rockabilly singer Karling Abbeygate also selected this dress to wear on the Red Carpet for the Hollywood Music In Media Awards!